A few weeks ago, a good friend of mine were talking about food and flavors. I was telling her how I find Asian food amazing, especially simple Japanese and Chinese dishes because they bring out this indescribable flavor, one that tastes so great but I just can’t figure our what it constitutes of. A kind of taste that, as the Iron Chef commentators put it, makes that ingredient honorable. My friend then tells me of this 5th flavor called Umami. I really didn’t get what it was, but a recent trip with my Japanese friend and her family really showed me what Umami was all about. The place. Kikufuji. The honorable dish. Sushi. I rarely go to the Little Tokyo area because some restaurants have been disappointing to me. Except for the Okonomiyaki shop, I’d rather eat my Japanese meal in Isshin. That is until my friend’s dad invited me to join them for a dinner out in a restaurant near their place. Kikufuji faces Pasong Tamo and is quite indiscreet, maybe shady for some people to go to. The place has this antiquated look and for those who might like front doors exuding with elegance, this might not be the place for you. But I love its antique feeling. Had it not been surrounded by the noise of busy jeepneys and takatak boys, I swear I could have been in some discreet alleyway in the middle of Tokyo, or maybe even Sapporo. More so, I didn’t feel worried about the place. If a Japanese family insists that I should eat Japanese food in this place, why should I contest? They know their stuff best after all. And true enough, I bow down to the loveliness of Kikufuji. I feel like I’m in a manga panel of Oishinbo or in one of those featured restaurants in Iron Chef. The center had a sushi counter and the sides had those lowered seats. The place smelled fresh, and with swimming fish greeting you as enter, you know you’ll be served fresh meats. In cases when I am a guest, I just leave it to the hands of my host to find food for me. They know what’s good. Else, they won’t even take me there. And knowing my Japanese hosts take their food seriously, I know they’ll come up with a great meal for me. And then my friend’s dad asked if I wanted sushi. Without hesitation, I answered yes! In a real Japanese restaurant that seems to know their sushi and uses the freshes ingredients (from the looks of it) YES!! I will have sushi! Her dad ordered for me a Teishoku (set menu) of sushi wherein I get to feast on 14 pieces of sushi and maki mixes. 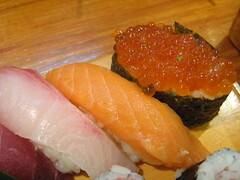 Sushi had hamachi, chuutoro, salmon, shrimp, tamagoyaki, and my now favorite sushi, ikura sushi. More than that, we also had some side dishes of seafood salad, some tsukemono, chicken skin yakitori, and some beef and asparagus maki. To add, we also had Futo Maki! There was a lot of food. I was basically drowning in some of the freshes food items I’ve ever tasted! The meal started with the salad which again had that indescribable flavors of Umami wherein the flavors of the ingredients just speak for itself. The salad was simple but there’s this indescribable sweetness and savoriness that just highlighted the ingredient’s flavor. Oh! The honorable tuna, cabbage, crab, and other things that were in that salad. You were much appreciated. And I have forever engraved your flavor unto my humble tongue. Other yummy food stuff piled in. There was california maki. 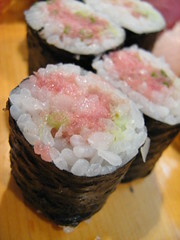 Negitoro (spring onions and minced tuna) maki (YUMMY!) and some yakitori. 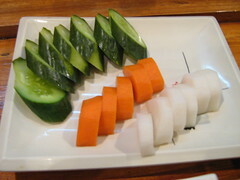 Yue’s favorite of pickled vegetables were also there. The main dish arrived with a bit of shock and surprise. 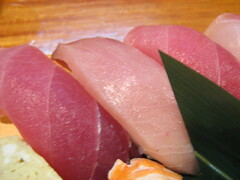 It was one whole set of sushi, shiny and brimming with freshness like it was just hauled out of Tsukiji. It looked yummier than any sushi I have ever eaten… EVEN FROM A HOTEL! They looked good… and they were good. 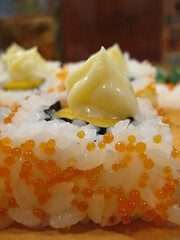 My favorite was perhaps my first shot in ever eating a sushi, Ikura Sushi. I’ve seen it as a toy, but never a real thing. So it was a delight to finally taste one. I also had a lesson on how to eat sushi the Japanese way. Apparently, what I have learned from Saisaki are basically wrong in all proportions. Basically, the wasabi is already placed on the sushi itself and then you grab the sushi in your hand, flip it so that the meaty side is at the bottom and then you swish it in the shouyu and put the whole thing in your mouth. THE WHOLE THING. It was strange, yet the honorable sushi deserved to be eaten whole than in pieces. 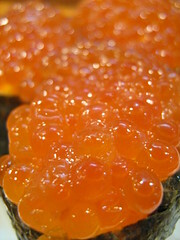 Else, you wouldn’t taste that umami that only this simple and fresh ingredient could provide. I told dad you liked the food there so much! & he said he’ll bring us there again! yatta!! But maybe next time its better to go to other Japanese restaurant ne?? I changed the gyuuaspara maki. XDD I was only writing it in between work and hunger. lol. But I really appreciate the invitations for dinner! <3 <3 I have been living here in this city for a long time and yet I don't feel like I know the city yet. <3 Thanks to your family for showing this side of Manila. Waaaai! Is this that resto outside Little Tokyo? I was asking Yue for resto recos and this is probably the one other than Tsukiji that she mentioned.